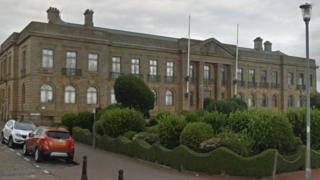 A coalition of SNP, Labour and Independent councillors has been formed to run South Ayrshire Council. The Conservatives are the largest party on the council after taking 12 of the 28 seats at last week's election. But the party failed to re-negotiate a deal with Labour, its former coalition partners on the local authority. The new ruling partnership contains nine SNP councillors, five Labour and two Independents. The coalition will be proposed at a meeting on 18 May. In a written statement, the partnership said: "In coming together, the new administration will put people right at the heart of our agenda, while working to manage the significant financial challenges facing the council. "We will announce our programme for action shortly but the cornerstone will be to ensure that every child can fulfil their potential and that no child attending school will go hungry due to austerity programme of the Conservative government at Westminster." It said it would review the way communities were consulted to ensure good investment decisions, and would build more affordable homes. It also said it would adopt a policy of no compulsory redundancies for council staff.